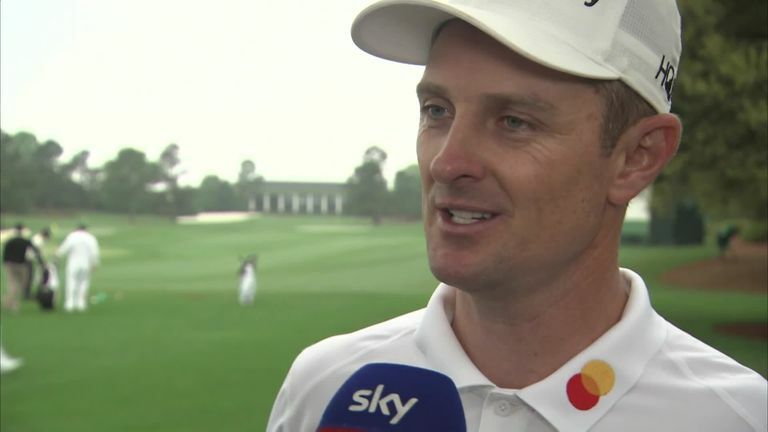 Justin Rose goes into the Masters with two significant returns to celebrate ahead of the first major of the year at Augusta National. Rose will tee up on Thursday as world No 1 having again dislodged Dustin Johnson from the top of the rankings on Monday, while he also has long-time caddie Mark Fulcher back on his bag for the first time this year. The Englishman has had Henrik Stenson's former caddie, Gareth Lord, as his bagman for the first three months of 2019 while 'Fooch' was recovering from minor heart surgery, but the pair have been reunited as Rose aims to go one better than his runner-up finish to Sergio Garcia two years ago. "Fooch is back this week which has been sort of a long-awaited arrival for him," said Rose at his pre-tournament press conference. "I know time has been going very slowly for him and he's been chomping at the bit to get back, but he's stayed very much integrated and engaged in my game. "One of his best mates out here on Tour is Gareth Lord, and they have been communicating a lot with what has been going on and Fooch has come down to see me on my weeks off on a couple of occasions. "Once he knew he was looking good to caddie this week, which was his ultimate goal, he came out to Austin, Texas to kind of get some of the back slapping out of the way so he could focus on business this week, which was smart of him." Rose also believes the input from Fulcher will be most vital if he is again in contention for his first green jacket over the weekend, adding: "I feel like we've learned together so much here, I wouldn't expect a nugget of information I don't know to come out during practice. "Where Fooch is going to earn his money and earn his position on the bag and earn his importance on the team is on Saturday and Sunday. Basically when emotions start to get more intense and there's more variability from that point of view, that's when I'm going to rely on him more and more. "If I had anybody caddie for me Thursday and Friday, I would probably be in very good shape and be very comfortable. It's when the going gets tough, that's when I think someone who knows you so well and we have so many positive experiences out there under pressure that we can draw on together; that's where Fooch is going to come into his own." When is the Masters on Sky? Players ranked No 1 in the world do not have a good record in the majors in recent years, but Rose insists there is no extra pressure on him this week as he bids to buck that particular trend. "I don't think I've ever stopped telling myself of how you get to No 1 and that's by moving forward and continuing to improve and get good results," he said. "I have won as world No 1, which is something that was important me. I was able to do that in San Diego this year, but clearly to win a major as No 1 would be even more fantastic. So you know, I use it as maybe a little inspiration, certainly not as an expectation, I don't think. "I always look at myself and think I can still get better, so that's what really motivates me is finding gaps in my game and trying to fill those gaps. The ranking is a moment in time where I've just done a better job than everybody else over a two‑year period. It's not that reflective in terms of this minute, it's a two‑year reflection. "So I look at the next two years, and how can I improve on the previous two."